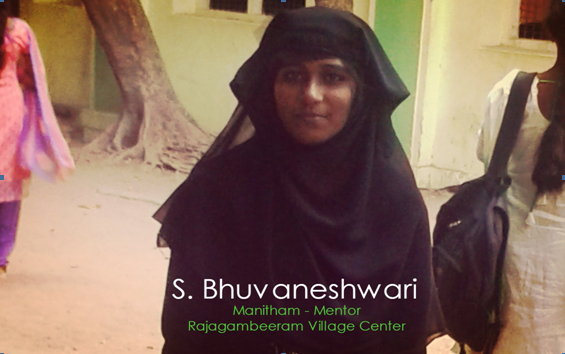 My name is Bhuvaneshwari, I am a mentor for Manitham at the Rajagambeeram Village Center. I belong to a village, in which a particular community is more dominant compared to the others. It is a community in which we are an economically poor Dalit family, that has to bear the brunt of the partiality and unfair caste system that has long lived in our community. I have a younger brother and a sister who are schooling in a nearby government school. My father works as a Mason and my entire family depends on him to run the household. This dependency made it very hard for us to run our day to day lifes. My family has always; found it difficult to live in the village since we have faced quite a lot of ill-treatment from the villagers because we are Dalits. People avoided talking to us and we became victims of untouchability through which we felt excommunicated from the community. We lived and survived in the village with a lot of fear and struggle since our childhood. Most days, we kept weeping thinking of our situation and looked for a solution to overcome the same. As a result, a few years ago with no other alternative, our entire family was converted and we became Muslims. That was one of the unbearable situation we faced and I wish that no one should face this ever like us. As people deserve the right to choose the god they believe in and community they wish to be a part off, but we were left with no choice. As per her words, I did not have anything to give to anyone or to my community apart from my knowledge. But the situation in my village became a mighty barrier to my ambition. A few years ago, god gave me the opportunity to give back to the community through Manitham which I had never expected. 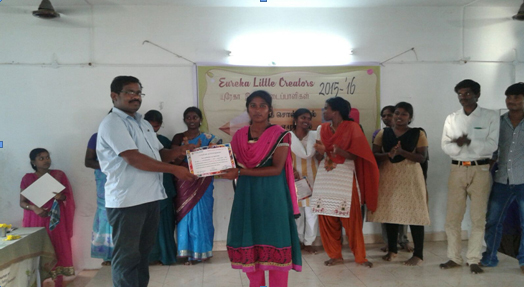 I was selected as a mentor for my village, to help support the center. Initially, I felt nervous of being a mentor in my village. But the weekly mentors meetings at the Manitham office, helped me overcome my fears and concerns. The training and motivation given to me by Manithams team and staff was very crucial in my development and growth as a mentor. Week by week, all the mentors including me gained a lot of confidence, ideas and knowledge through our coordinators and coaches. The biggest lesson I learned from Manitham is, that one should never be afraid of speaking to anyone when one’s mind is truthful. And the other thing is tolerance and acceptance to any situation. For the past one year, I serve as a mentor to nearly fifty children which make me feel like a proud mother at young age. 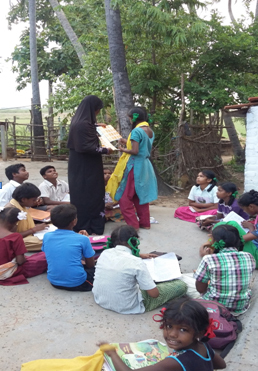 We are running our centers with not only coaching, but also with activities like singing, dancing and speeches. This really encourages the kids to attend, and we record really good attendance at our centers. Initially we faced some disturbances from villagers like switching off of lights, playing near our centers and eve teasing. But I and my co mentor were patient and kept running the center as usual. As time passed, the villagers changed their thinking and manners day by day and started showing us respect as they understood our importance and purpose. My family members grew happier than ever since I started serving as mentor which gave me and my family a prestigious status in our village. 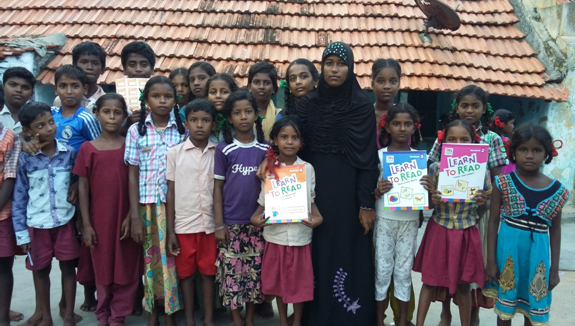 Through Manitham, the gain is not only for children of the community, but also for mentors like me. Now with Manithams support and guidance, I am doing my B.Sc physics in Raja Duraisingam Government College, Sivagangai. I have transformed into a very confident young girl who wants to achieve everything in her life and who is brave enough to face any difficulty or barrier that is put in front of her. I am very thankful to Manitham Trust. I gained lots of experience and memories through Manitham and lot of friends too. My service for Manitham and their initiatives will continue till my existence. Every individual reaches a turning point in their life a certain point, wherever everything is going bad and there is a need for a positive change. For me, my life entirely turned around for the good all because of Manitham. This entry was posted in Diaries. Bookmark the permalink.